Diplomatic Notebook: India has a vital interest in the establishment of peace and stability in West Asia. It is time to step up our engagement. 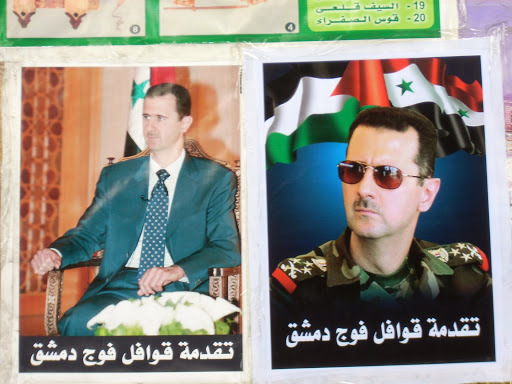 The two faces of President Assad: Side-by-side wall posters in Damascus capture the modernising face of the young Syrian leader Assad as well as the more traditional one, as the head of a state where political reform has yet to encompass a legal role for the opposition. Syrian President Bashar al-Assad’s statement that a “rising India” could help “balance” the Middle East peace process ought to be seen by New Delhi as an opportunity to deepen its engagement with a region that is of vital strategic and economic interest to it. The area that the Commerce Ministry calls “West Asia and North Africa,” or WANA, accounts for 20.92 per cent of Indian merchandise exports and is the second most important export destination for the country after the European Union, which accounts for 20.93 per cent, according to Commerce Ministry data for the first quarter of 2007-2008. Since exports to the region are increasing by approximately 30 per cent every year, faster than for Europe, WANA will be the single most important market for Indian companies by the end of the year. And then there is labour and investment too. The six Gulf countries are home to nearly three million Indian workers (who remit some $6 billion annually) and Indian public and private sector companies have cumulatively invested more than $10 billion across the region. Add to this the fact that the bulk of our crude oil, natural gas and phosphates is also sourced from the region and one immediately realises there is no place in the world quite as crucial to India’s well-being as this. Festering disputes in the region include the Israeli occupation of Palestinian and Syrian territory, instability in Lebanon, the conflict in Iraq, and the American pressure on Iran over its peaceful nuclear programme. And these are just the major ones. 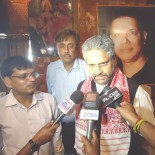 It would take a brave Prime Minister or Foreign Minister of India to presume New Delhi could help resolve any of these complex problems, especially those which have lingered for decades on end. And yet, India cannot wish the problems of the region away either. For in most of these cases, the dominant approach being pursued by the major powers is likely to increase — rather than decrease — the prospects for instability and conflict. Whether we like it or not, President Assad is right when he says that India is going to be affected by the region’s problems. The Prime Minister has a Special Envoy for the Middle East, the able diplomat Chinmay R. Gharekhan, but no one seriously expects India to insert itself as a mediator between Damscus and Tel Aviv or between Israel and the Palestinians. What New Delhi can achieve by stepping up its engagement, however, is some “balance” in an otherwise imbalanced process. Disputes become more acute when one side succeeds in isolating or marginalising the other, as Israel and the U.S., with the partial complicity of the Europeans, have managed to do to the Palestinians. The tragedy that is unfolding in the Gaza strip thanks to the inhuman Israeli blockade, for example, poses as urgent a humanitarian challenge to the world as any other. If India were to be as generous with its assistance there as it has been, for example, to the Karzai government in Afghanistan, the political and strategic impact would be at least as great. And it would help send a signal to the Zionist state and its backers that the Palestinians are not without friends who care. Similarly, seeking mutually beneficial economic ties with Damascus and Tehran at a time when Washington is attempting to isolate both regional powers would be of enormous assistance to that section within the U.S. establishment which favours dialogue with America’s “enemies” in the region rather than the use of sanctions and force. One of the casualties of the U.S. pressure on Damascus, at least according to President Assad, is the pace of political reform in Syria. When the younger Assad inherited the presidency from his late father, Hafez al-Assad, in 2000, he cultivated the image of a moderniser who wanted to ease up on some of the restrictions that had made his country one of the most closed and repressive states in the region. Even after the short-lived ‘Damascus Spring’ of openness — which prompted some disquiet within the ruling Ba’ath establishment — Dr. Assad persisted with small measures. He liberalised access to Internet (though blogs are being blocked since 2006) and allowed private newspapers, magazines and radio stations. The contents of these tend closely to mirror the official notion of news but Syrians are free to tune in to foreign news channels like A l-Jazeera for a more objective account of what is happening in the region. I asked President Assad what his vision of Syrian politics was like for the next five years. Reform was needed along all “axes” of life in Syria, he said, but he had sought to move the fastest along the economic axis where there was the greatest urgency. Some of the “reforms” the regime has embarked upon are no doubt bold. Subsidies are being cut and most recently, heating oil prices were raised some 300 per cent. On the question of democracy, the President raised the spectre of both Algeria and Lebanon where free and fair elections produced sectarian outcomes and led eventually to violence. “They had good laws but the circumstances were not good.” Within Syria, he said, the government was beset by one emergency after another: the intifada in Palestine, the problems in Lebanon, 9/11 and the fallout in the region including terrorist attacks inside the country. Then came the Iraq invasion and the pressure from Washington, including the imposition of sanctions. But Dr. Assad says he still intends to move along the political front. On the anvil: an upper house of Parliament to allow “the participation of different currents” (i.e. those not affiliated to the Ba’ath-led National Progressive Front), a new administrative law to have, in his words, “freer and more dynamic elections,” and third, a new modern party law to provide a legal basis for opposition parties. Social and personal life in Syria remains refreshingly free of the meddlesome diktats common to much of the Middle East. Those who wish to drink alcohol are free to do so. Pork is available for Christians. Yoga has a small but loyal following. Restaurants do not down their shutters out of deference to those fasting during Ramzan and middle class boys and girls conduct themselves in much the same way their counterparts in Mumbai or Delhi might. And yet, visiting Damascus after a gap of 24 years, it is hard not to notice the fact that society seems to have become more religious. The number of women wearing the hijab has increased, for example. According to one Syrian analyst, closer observance of religious practices has become more pronounced amongst the affluent. “Wealthy women here drive SUVs, and wear the hijab,” he noted. Islamic social charity organisations like the Qubaysis have grown in size and reach and are tolerated by the strongly secular government provided they do not engage in political activity. Organisations like these had the “right to practise any kind of activity related to Islamic teachings but not in politics,” President Assad said, reiterating his view that Syria, which was a “mosaic” of peoples of different faiths, would never allow “sectarian currents” to enter political life. This entry was posted on June 17, 2008 by Siddharth Varadarajan in Indian Foreign Policy, West Asia.